Perhaps one of the oddest pain-related symptoms is the "MS hug" (a.k.a. girdle-band sensation, girdling, or banding)—the feeling like there's a tight band around the chest and ribs. This can come and go over the course of several weeks and range from an annoying pressure to abject pain. Though it's common in MS, this type of pain tends to be one of the most annoying and uncomfortable symptoms that MS patients experience. Like many MS symptoms, the MS hug feels different for each individual. It can also feel different in the same people on different days or at different times of the day. This pain usually occurs somewhere in between your neck and your waist. You might only feel it on one side or in one small area; at other times, it can wrap around your entire torso. The pain can occur in waves that last seconds, minutes, or hours, or it can be steady for longer periods of time. Like other symptoms of MS, this type of pain can intensify or be triggered by fatigue or stress. It can also sometimes be accompanied by a sensation of difficulty breathing, which is why it may be perceived as a heart attack or panic attack. Chest pain needs to be taken seriously. Be sure to seek immediate medical attention if you experience severe chest pain and/or you're also having difficulty breathing or other signs of a heart attack. Even if you think it's simply MS-related, see a doctor to be on the safe side. The MS hug is caused by a lesion or an area of active inflammation within the spinal cord. This means that the myelin sheath, the coating that insulates nerve fibers, has been damaged. The type of pain caused by the MS hug is technically classified as a neuropathic type of pain, also called a dysesthesia, which refers to any abnormal sensation. 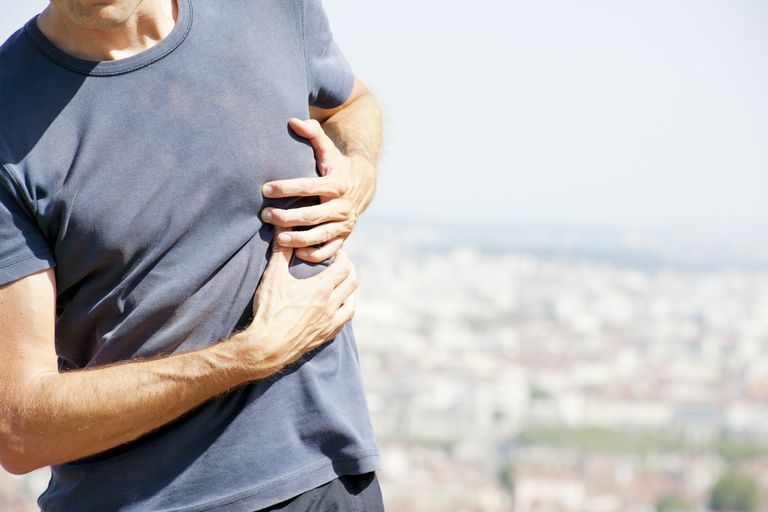 The sensation itself is the result of tiny muscles between each rib called intercostal muscles going into spasm. These muscles have the job of holding your ribs together, as well as keeping them flexible and aiding in movement, such as forced expiration. But like everything related to MS, the root cause of the MS hug has to do with damage to the myelin sheath. In cases where you've already been diagnosed with MS and the MS hug starts up suddenly along with other symptoms, it's possible that you're having a relapse. While you should not be shy about sharing details of your discomfort with your doctor—information that can help lead to a diagnosis—your doctor will still need to do a thorough workup if your symptoms are similar to those of MS hug because a number of other health conditions can mimic it. If your doctor determines that your hug pain is indeed MS-related, there are some ways it can be treated, depending on the severity of your pain and whether or not you're having a relapse. In many cases, you won't need treatment and the pain will pass on its own. Some doctors have used Botox (botulinum toxin) injections to selectively reduce muscle spasticity. Botox blocks a chemical neurotransmitter called acetylcholine, allowing your muscles to relax. Treatment is typically indicated for those with severe pain and can last for up to six months with relatively few side effects (mainly injection site pain or redness). Botox is also commonly used to treat severe MS-associated bladder dysfunction. If your doctor thinks that your symptoms indicate a true MS relapse, he or she may prescribe a course of a high-dose corticosteroid known as Solu-Medrol. While it would be nice to be able to erase the pain of MS with a simple pill, that's usually not the case. Instead, many people manage their MS pain by embracing tried-and-true home remedies used by others who experience similar discomfort. Because of the individual nature of pain, you may need to try a variety of methods before you find what works for you. It may also take a number of strategies used together to combat your MS pain. Even though MS hug pain is a common occurrence, this doesn't make it any less difficult to deal with, especially if you haven't experienced it before. If your pain isn't going away or you're unable to relieve it using home treatments, be sure to talk to your doctor about prescription medication options that can help. And as with any chronic condition, work to make your lifestyle as healthy as possible to help minimize your MS pain by eating a healthy diet, getting adequate sleep, staying hydrated, learning relaxation techniques to combat stress, keeping appointments with your doctor, and staying active as much as you're able. Drulovic J, Basic-kes V, Grgic S, et al. The Prevalence of Pain in Adults with Multiple Sclerosis: A Multicenter Cross-Sectional Survey. Pain Medicine. 2015;16(8):1597-602. doi:10.1111/pme.12731. Multiple Sclerosis Trust. MS Hug. Updated July 2018. https://www.mstrust.org.uk/a-z/ms-hug. National Multiple Sclerosis Society. MS Symptoms: Pain. https://www.nationalmssociety.org/Symptoms-Diagnosis/MS-Symptoms/Pain. Is There a Link Between Food Allergies and MS? Are Muscle Twitches a Symptom of MS?